My father would often tell me, “MaryAnn! Don’t put off for tomorrow what you can do today!” Maybe I heard these words often because I, like others, sometimes leaned toward procrastination. He knew, what I also now realize, today is the only moment I have. Today’s opportunities will vanish in evening’s sunset. My earthly father was echoing the voice of our Heavenly father. Though the former is no longer with us, the later continues to speak the wisdom of today’s fleeting nature. I have a lengthy “To Do” list. Many of the items listed are trivial. As a matter of fact, the most important “To Dos” don’t even appear on this random list. When I was in the full-time workforce, whether my supervisor was present or absent, I cultivated an attitude of continually giving my best. It is a practise that has benefited me now that schedules are self-appointed and goals are self-established. But you, lazybones, how long will you sleep? Procrastination is much more pleasing to my ear than “lazybones!” Today is good day to work diligently at whatever God puts in front of me. The season may be fast approaching when I will not be able to do the things I now am capable of. Ants can carry 20 to 100 times their own body weight. That is a lot of lifting! May my work ethic set a similar example to others. for God takes no pleasure in fools. I know of some people who have “bartered” with God in a season of desperation. “Lord if you will _________, I will ___________.” When things are going smoothly again, promises fade into distant memory. There have been times in our marriage when I seriously wanted to escape that promise. More than once, I’ve pulled out our wedding vows and recommitted myself to the best of my ability fulfill my promise. Sounds foolish maybe, but it gave me the strength and grit to see it through. Today is a day to keep my promise to God and others. If I wait until I feel like, that day may never come. It is in the doing that the feeling lines up. Whatever knowledge I have of God’s command, I am responsible for walking in. Before I understood, God’s desire, I was not responsible to fulfill it. As children grow their responsibility level increases. At first all their needs are met. As their learn to feed themselves, they do. When they become school age, applying themselves to learn is a reasonable expectation. As they reach adulthood, there are increased levels of responsibility and expectations to apply. The same is true in the spiritual. God calls us to love one another, forgive each other, encourage each other, serve one another, honour one another, and be devoted to one another, to name a few. In a community of support we spur each other on to follow God’s commands. Today is a good day to obey! Today – Hear and Respond! The most critical “To Do” is responding to His invitation to enter into a personal relationship with Jesus Christ. If you have never done this, “Today” is a perfect day! Every tomorrow after today will be impacted by this one choice. Many people have already made the decision to become a Christian, by accepting Jesus Christ as their Saviour and Lord. Others delay, thinking there will be another day! The tragedy is, there may not be. After this life is eternity. Life does not end when your body dies. Your spirit lives forever. What we do with this decision about Jesus will determine where and how we spend that eternity. Will that eternity be in the Presence of The One who is Life, or will it be in the place of doom designed for Satan and his emissaries? Today is the day to hear and respond to God’s wonderful gift of salvation. Today is an open door before us. Let’s step into it with vigor checking a few things of that “To Do” list. 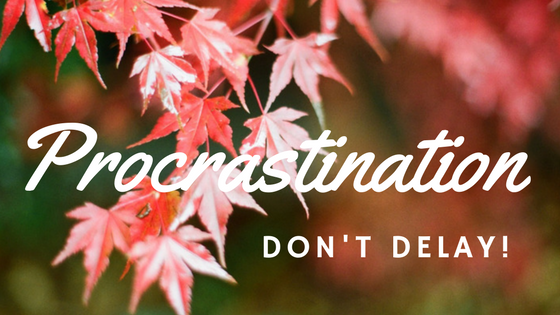 Let us focus on the things that matter the most, setting procrastination aside! Not done yet? Want to read more? If you enjoy reading my blog and want to receive it automatically … Sign up here!